Main purpose of Maranta Sound Academy is to educate in use of Sound for health and relaxation in your daily or professional life. In our journey we have encountered the Peter Hess sound methods, which come with excellent quality equipment – singing bowls. 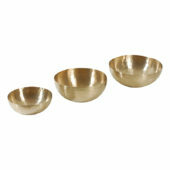 We are proud to offer you sound quality singing bowls and gongs as well as a choice of other instruments and accessories. All of our equipment, imported from Peter Hess Institute in Germany is of guaranteed superb quality and intrinsically suitable for the Sound Work. Read more about Peter Hess sound bowls here. with handle and hanging loop (inside / outside).